"Infused with scents that take you on a journey to rediscover your inner joy,peace, and tranquility, Chesapeake Bay Mind & Body invites you to explore the amazing world of fragrance and its powerful impact to inspire and delight our lives"
Awaken your senses with the energizing notes of lemongrass and verbena wrapped in invigorating eucalyptus leaves, aromatic lavender, and garden mint. This harmonious fruity accord of sweet pear, dewy waterlily and green rainforest blossoms add a sense of balance to your interior. Fresh lavender and bright marine notes merge with oak moss, warm amber, and white cedar revealing a touch of confidence and freedom. A blissful fruity bouquet of sugared cranberry, plum nectar and blooming dahlia blend with mahogany, creating an elegant and joyful aroma. A poetic blend of grapefruit,peach nectar, and tropical mango is freshened by a delicate floral bouquet, capturing the feeling of a new romance. 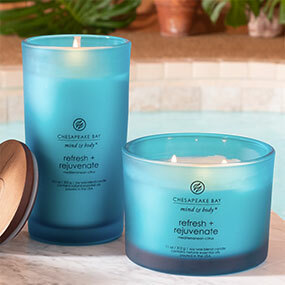 Tranquil notes of exotic jasmine, delicate cashmere woods, white musk and sandalwood create a soft and peaceful escape. Create a serene environment with soothing bergamot, rosemary, and lavender while touches of orange blossom, thyme, and patchouli enhance the calming aromatherapy benefits. Crystal turquoise waves splash on to juicy mandarin, pink grapefruit and bergamot. Aromatic cardamom and aldehydes surround the pure freshness of luminous white lily and petitgrain over hints of cedar and white musk. "When finding time has become a luxury, one needs to pause and look inward to redefine inner peace and inspire others."